Bang Krachao is compared as a remote oasis from the concrete jungle of Bangkok. The magnificent view, beautiful floating martket and delicious food are what you can explore in this island. Why Bang Krachao is special ? 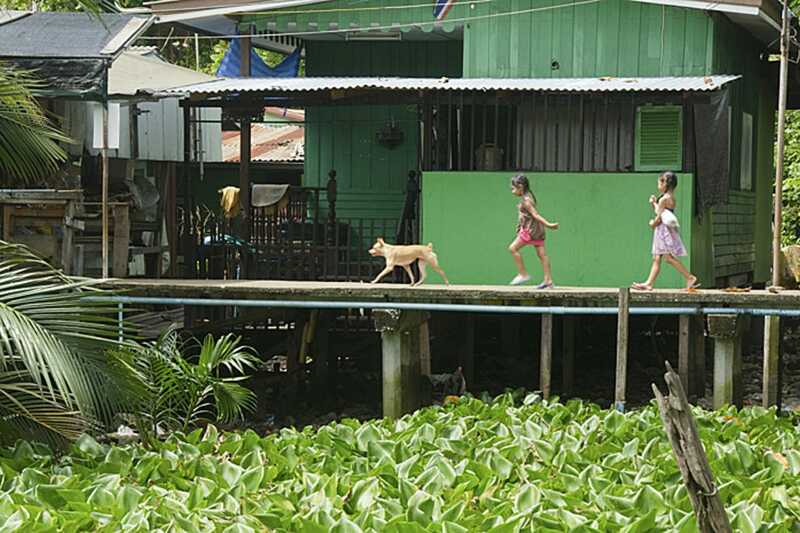 Many visitors to Bangkok don’t know it, but there’s an (almost) island of expansive, unspoiled greenery located just across the Chao Phraya River. Pretty much void of commercial development, Bang Krachao is instead filled with mangroves and orchards and is a great place to escape from hectic city life for a while. What to explore at Bang Krachao? Once you take the boat across the river and arrive to Bang Krachao (บางกระเจ้า), you’ll get dropped off at a little wooden dock and house. From there, you can probably find a motorbike taxi to take you somewhere you want to go, but the better option is to rent a bicycle (or bring your own). Bicycles are available for 50 THB per hour, or 100 THB for the whole day. On Saturdays and Sundays, Phra Pradaeng is home to the Bang Nam Pheung floating market. The market is somewhat of a local Bangkok tourist attraction, and every weekend, big crowds of Bangkokians show up to walk around, go on an outing with their families, and eat lots of delicious things. When it comes to eating, no matter how remote you may feel, you’ll just about always find food to eat in Thailand. When you’re biking around Bang Krachao, you’ll find a few small local restaurants; Stop in at any of them, have a refreshing beverage, and a bite to eat. How to get to Bang Krachao? There is an MRT to Klong Toey Station or a BTS to Ekkamai Station from where one of the taxis stopping will know where this is. Ask to be dropped off at the 7-11 store at Wat Klong Toey. Then take a short walk to the small pier and wait for a local to offer to take you and your bike on the small boat for thb10. Beautiful contrast to the busy city sites. No life jackets in the ferry boat. There are couples of bikes with child baskets on the front handlebars. The low-volume traffic means this rural escape - right across from the smoke of Bangkok - can be a regular weekend meeting place for two-wheeled wanderers. Start early to avoid the heat. Not a lot of traffic in this part of town, so it's great for any level of biker. You also can the Siam Fighting fish museum, set in beautiful grounds and the royal park. Just a few minutes from Bangkok so it is very convenience for a day trip with family and friends.We started off at around 14:30, took a ferry from Wat Bangna Nok with a bunch of 5-7 grades. The ferry cost 5 bahts each (we brought our own bikes as rental is unpredictable). We got off at Wat Bang NamPhueng Nok, in front of the Wat (temple) is BuaBuengPattana road where we turned right (we planned to do a counter-clockwise loop). From there, it is about 5 km. to the Srinakhon Khuean Khan Park. We rode past the Park about 100m. then go straight into an, elevated walkway, small winding lane crisscross thru the orchard. The ride inside the orchard was magnificent, shady, cool and we saw a lot of suburban activities. Made a loop inside and back out to the main road (Soi Wat Rat Rangsan) about 100m. before the Park. We did one round in Srinakhon KhueanKhan Park, continue on Wat Rat Rangsan road and made a water break in front of Wat Rat Rangsan School. from there we hit a larger road (Phetchahung Alley), made a right turn and took a second left on Wat Bang Nam Phueng Alley, passing PooYai Aoy Longstay, made a left then right at OTOP village into a small walkway. It is pretty much like a circle in there. You can stop at Bangkok Treehouse for cold beer. We came out right next to the pier and took the ferry back to Samut Prakan. Overall a fun trip for the kids. If you have strong sense of direction then there should be no problem even with a couple of mistaking turns. Otherwise a map or GPS would greatly help.There are other pier that will take you across to Bang Krachao eg. pier neat Wat KlongTuey Nok. We were given advice to cross from the Bang Na pier. When we got to Bang Krachoa on a Saturday they were out of rental bicycles so we had a choice of taking a taxi/motorbike taxi or just walking along some of the bike trails. We did try a bit of street food and enjoyed a cold beer at the Bangkok Treehouse, and walked along some of the bike paths, but overall we were disappointed...maybe we crossed at the wrong spot, and maybe if we had been able to rent bikes we would have gotten to the more picturesque areas. Although we didn't have the experience we had expected, we did have quite and adventure getting there and back, so it was a good day! We started off at around 14:30, took a ferry from Wat Bangna Nok with a bunch of 5-7 grades. The ferry cost 5 bahts each (we brought our own bikes as rental is unpredictable). We got off at Wat Bang NamPhueng Nok, in front of the Wat (temple) is BuaBuengPattana road where we turned right (we planned to do a counter-clockwise loop). From there, it is about 5 km. to the Srinakhon Khuean Khan Park. We rode past the Park about 100m. then go straight into an, elevated walkway, small winding lane crisscross thru the orchard. The ride inside the orchard was magnificent, shady, cool and we saw a lot of suburban activities. Made a loop inside and back out to the main road (Soi Wat Rat Rangsan) about 100m. before the Park. We did one round in Srinakhon KhueanKhan Park, continue on Wat Rat Rangsan road and made a water break in front of Wat Rat Rangsan School. from there we hit a larger road (Phetchahung Alley), made a right turn and took a second left on Wat Bang Nam Phueng Alley, passing PooYai Aoy Longstay, made a left then right at OTOP village into a small walkway. It is pretty much like a circle in there. You can stop at Bangkok Treehouse for cold beer. We came out right next to the pier and took the ferry back to Samut Prakan. Overall a fun trip for the kids. If you have strong sense of direction then there should be no problem even with a couple of mistaking turns. Otherwise a map or GPS would greatly help. There are other pier that will take you across.